Potty Training Is So Hard! After my post at the weekend about the Best and Worst of last week being around potty training things went down hill quickly yesterday. To say that it tested my patience, strength and resolve is an understatement. The day started well. C asked to take his bedtime nappy off and used the potty happily and put his big boy pants on. Hurray I thought, he is really getting it! I spoke too soon. What a nightmare, two accidents before 10am and then a really bad poo accident and I was so tempted to stick a nappy on him and leave it. But I decided that I would have wasted all our hard work over the last few days and I would be giving him an easy way out too, not just me. So I cleaned him up and stuck pants on again and luckily we had no more accidents! So far today we are going ok. No accidents but it’s quite hard work. On Saturday he was brilliant, no accidents, lots of potty trips, all instigated by him. Where did it all go wrong? Before I start this review I just want to say thank you to Keira O’Mara, the lovely lady behind the Mamascarf for supplying me with a beautiful French Navy Mamascarf to try out and review. Mamascarf is an award winning breastfeeding scarf that not only allows mothers to breastfeed stylishly and discreetly but also provides essential support without the need for a cushion. The Mamascarf can be worn as a scarf, or neatly folded away. It even comes complete with a hidden pocket to store your breastpad. It is easy to use and won’t draw attention to you. Covers you before and after feeding. The perfect gift idea for someone special who is pregnant. 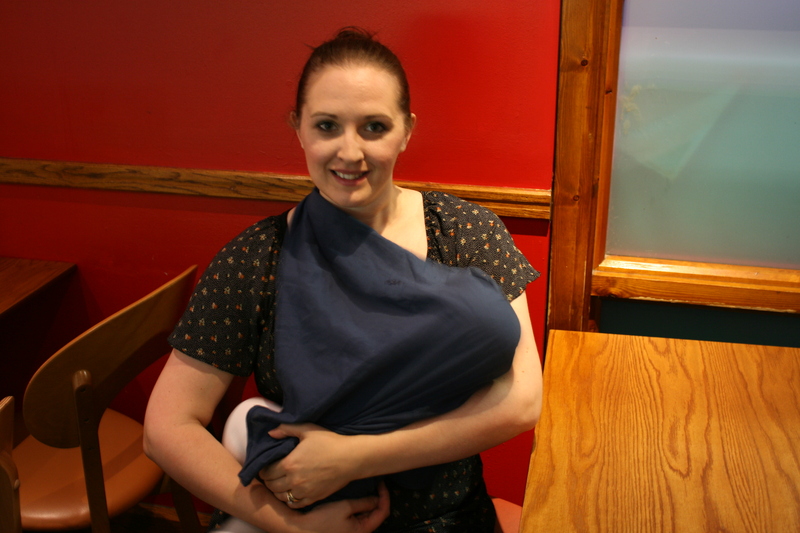 Was invented by a breastfeeding mum for other breastfeeding mums! You can still see your baby and maintain eye contact. New improved soft tactile cotton. Can be used to feed any age baby. The textured fabric is great for disguising creases. 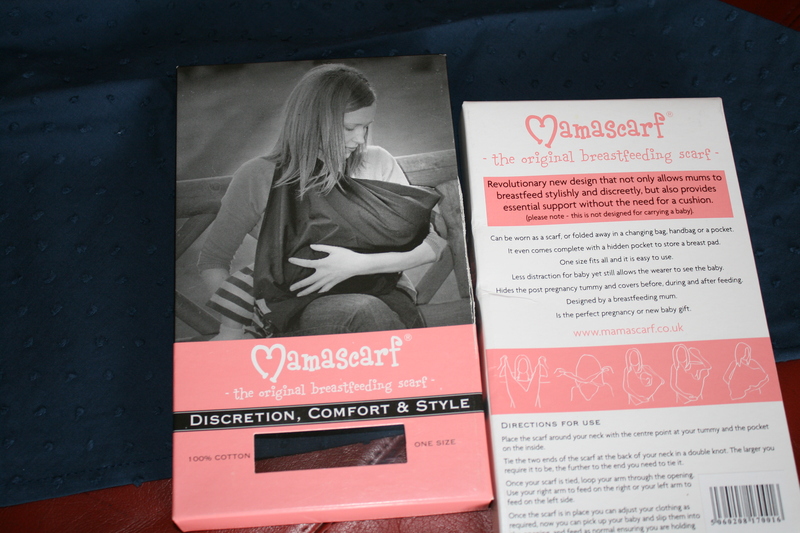 What we thought: Lets be honest, the Mamascarf is a product for me! The Mamascarf is lovely, I chose the French Navy scarf as I love navy, its classic, won’t clash with my clothes and would hide a bit of dirt! It’s also available in Black, Cream and Retro Leaf, all of which are nice in their own way. The Mamascarf is great as it comes in use for a number of different things. On holiday this week I have used the scarf for feeding, as a shawl when it turned cool, as a hat when it rained, as a mini rain cover for LissyLou when it drizzled and as a pillow for C when he was tired!!!!! Talk about value for money, all that from one product. The Mamascarf retails at £17.99 (plus postage), I didn’t think this was bad, a normal scarf costs anything from about £5 to £30 on the High Street and wouldn’t be as useful for feeding! I would buy this scarf as a gift for a new mum, its the sort of thing that you maybe don’t know you need until you get it, but then you don’t know what you ever did without it!! Before I start this review I just want to say thank you to Jon Rathbone the man behind Pourty for supplying me with a blue Pourty to test. 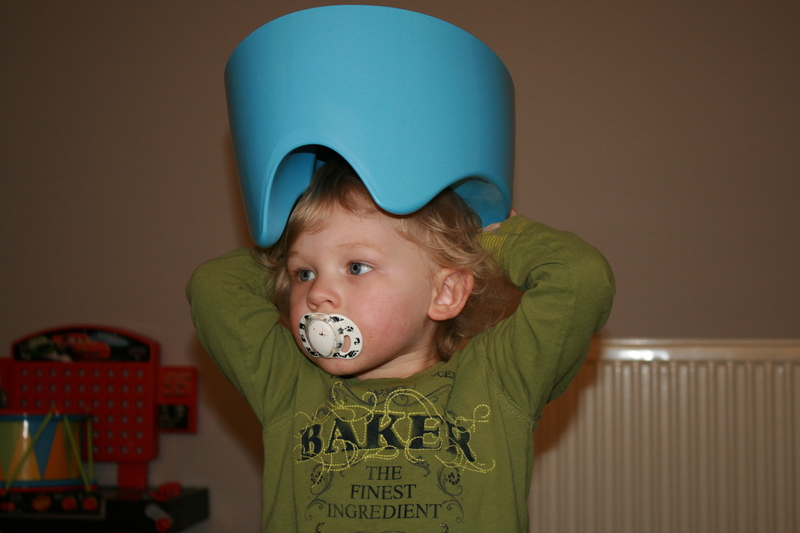 The Pourty potty is the brilliant new baby and child’s potty that makes potty training boys and girls easier. What we thought: The Pourty arrived to shouts of delight from C, “My new potty, for wee wee!”. So it must have looked like a potty. Except the Pourty is not your average potty. Its unique pour feature is really clever, it makes getting rid of ‘the business’ much easier, more hygienic and quicker. 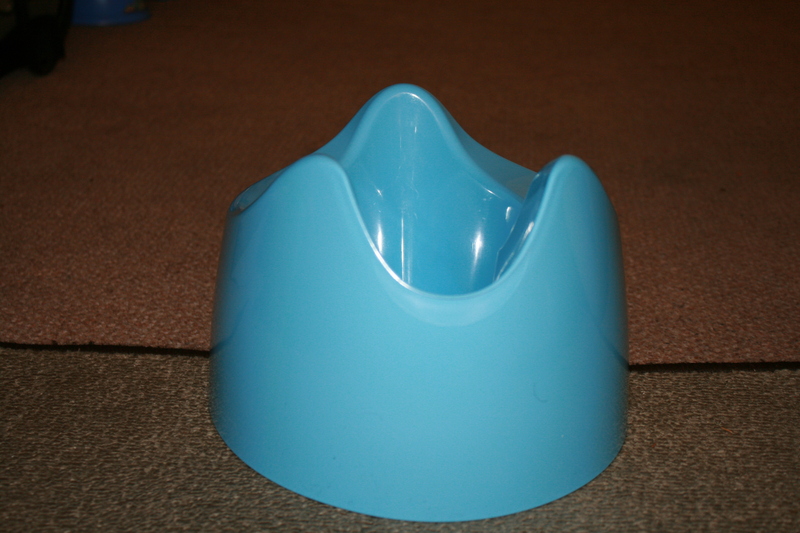 The Pourty is well made, the seat is wider than on a lot of potties I’ve seen, this was better for C, who won’t sit on a normal potty as they hurt his little bum. Its available in 4 different colours, BLUE, CREAM, PINK and PURPLE so something for everyone. 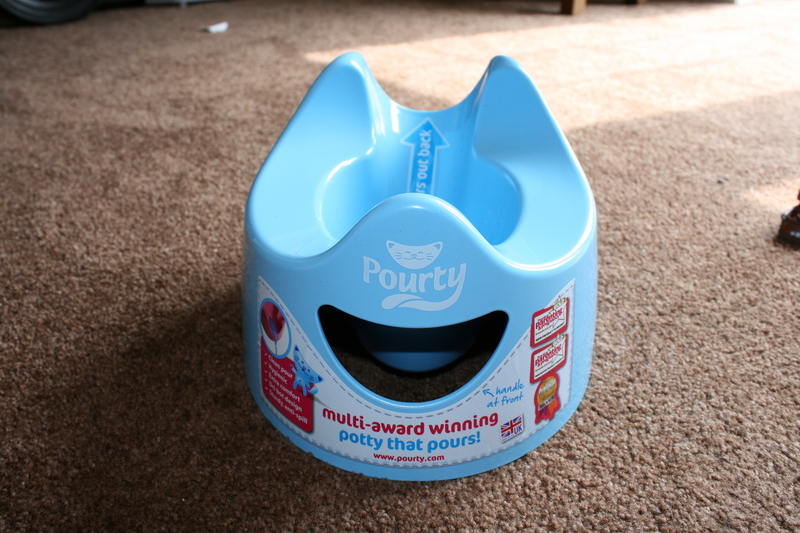 The Pourty is also sturdy, with a normal potty C can tip them over getting on and off, you can imagine the consequences (YUK!). With the Pourty, this isn’t an issue, its wider seat makes it more stable and I tried to see if he would knock it over but even after getting on and off a number of times C didn’t even make it wobble. The handle on the front makes carrying the Pourty easy and helps you to easily use the prime feature the special pouring ‘duct’ or as C calls it the slide! I filled the potty with water to test out this function, well you never know with new products how they will fair, if you will use them ‘correctly’ or actually if they are any good. The Pourty passed all my attempts to splash the contents everywhere, it poured cleanly and accurately into the loo. I tried pouring at awkward angles (as you might do in a hurry) and it stood up to the test, the duct channelled all but the tiniest drip straight down the way it was supposed too. I was impressed! Often, you see a new product on the market and think to yourself is that the sort of invention that didn’t need inventing? Not the Pourty, I don’t think I would have realised its greatness had I not tried it but now I can’t see why no-one has thought of this before! Yesterday was a day of HIGHS and lows. So more HIGHS than lows = pretty good day! I always knew that C would tell me when it was time to start potty training. Believe me, I thought it was months away yet! Well he didn’t so much tell me as scream loudly in my ear “MUMMY, I NEED A WEE-WEE……….NOW” So picture me jumping off the couch at lightning speed, grabbing the potty and ripping his nappy off as fast as humanly possible, all the while sure that this was yet another false start. Nope two seconds later he stands up with the proudest smile ever and proclaims “I DID IT!” Sure enough, there in the potty is a wee, I have never been so happy to see wee in my whole life.